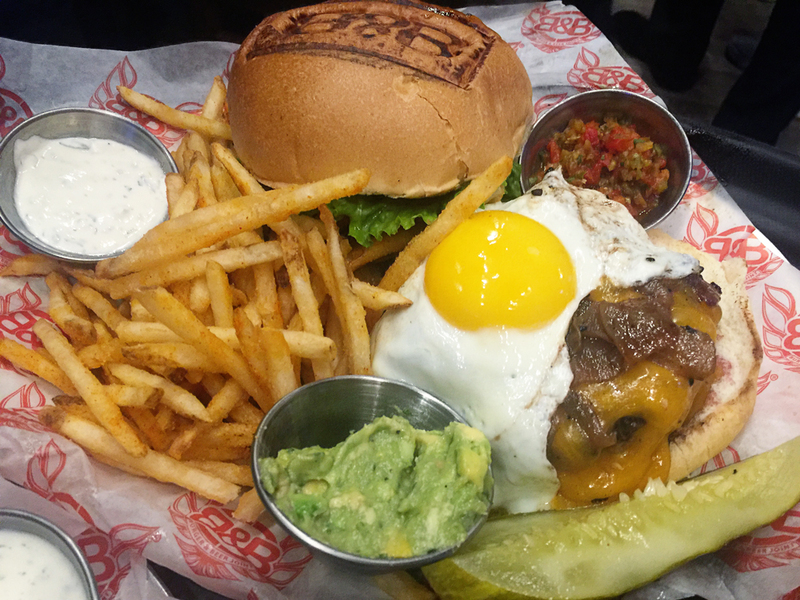 You may have already heard the name — and even tried their nom-nom worthy burgers — now Burger & Beer Joint has made the trek farther west to Dolphin Mall. Sticking to what they know best, you will still find fan favorites on the menu like the Hotel California and Mustang Sally. During the weeks of their soft opening, Burger & Beer Joint hosted bloggers and foodies alike to enjoy a prix fixe menu, live music, and ceremonial cutting of their MOTHERBURGER. And as part of the 32,000 square-foot expansion at Dolphin Mall, BB&J is making its mark in the lineup of new restaurants. After a few words from our host, we were served a sampling of brews from the list of more than 75 beers offered at this Jupiter-based restaurant. And like responsible adults, we finished them all and picked one for the full glass. Opting for a classic dark brew, I ordered the Colada Porter (Biscayne Bay’s signature) for its bitter coffee finish. Another favorite at our table was La Rubia — one of the lighter beers from Wynwood Brewing Company. From the prix fixe menu we tried three appetizers: Mini Corn Dogs, Octane Wings, and the Beer Battered Onion Rings. The corn dogs were the perfect small bite dipped in the house mustard; while the wings paired with the mild sauce and bleu cheese dressing were in true fashion of sports bar food. They did not last on the plate too long, not even for that epic #foodpic. One dish I was surprised to obsess over was the onion rings. Never one to order them anywhere, B&B truly surprised my taste buds with the colossal onions—thin and incredibly crispy, drizzled with jalapeno-cheddar. A special treat was delivered to our table (okay, we begged for it) and was quickly devoured. Just in case you have not tried their Mac Daddy Cheese Gratin, we are telling you now! The three-cheese Mornay sauce, panko bread crumbs, and parmesan cheese make this comfort food worth all the calories. As for the rest of us less adventuresome, the not so mini-me gourmet burgers hit the spot. My choice: Thunder Road. A twist on the classic American burger, the ½ lb. premium beef blend is dressed with thick sliced Applewood smoked bacon. The bourbon BBQ sauce and American cheese are married together under the lightly toasted sesame bun. B&B also offers nontraditional protein options between the bun (or no bun if you order the Buck Nekid), like wagyu, bison, or even Maine lobster salad with a warm tempura mahi-mahi cake. If you can keep eating at this point, the after dinner treats at Burger & Beer Joint include adult shakes and other ice cream based desserts. And if you think cake vodka sounds dangerous, try ordering a Spank the Monkey. A popular dessert for all was also the Maroon 5 — deep friend crispy Oreos with your choice of chocolate or vanilla ice cream. We don’t need them to change for us one bit, but we are glad B&BJ found a new home at Dolphin Mall, located on 11401 NW 12th Street, Lot R102.